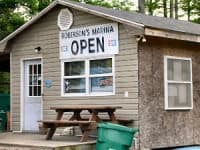 Everyone in eastern North Carolina knows about fishing. And we have all caught a cat fish. When I wanted a good recipe for Cat Fish Stew, I called up Carolyn Roberson who ran Roberson’s Marina. This is her recipe. 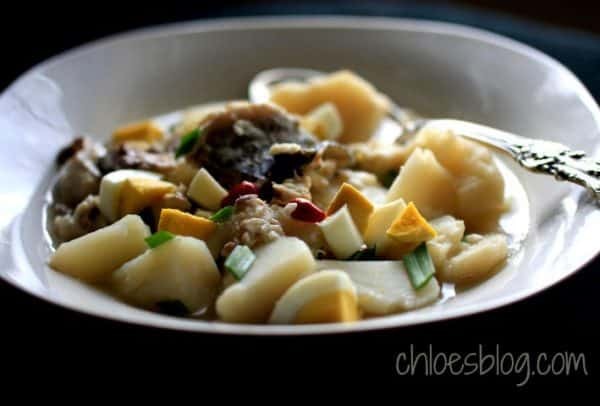 This Cat Fish Stew can also be made with any fish. Gardner’s Creek is a slow moving, winding black-water creek in Eastern North Carolina that eventually makes its way to the Roanoke River by way of Devil’s Gut. 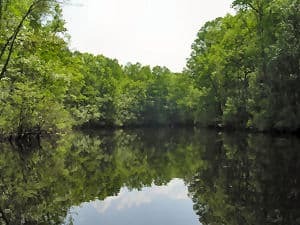 Gardner’s Creek is a favorite of canoeists who enjoy its pristine beauty and the fisherman, who quietly sit in their boats waiting for that one bite that will yield the big one. Several years ago I was at the creek and I felt like Tom Sawyer or even Huckleberry Finn as I watched the young boys, wearing cut-off jeans climb the tall trees, swing out over the creek and drop into the dark water, popping up a few feet away. I now have my inflatable Avon dinghy, with an engine of course, and whenever I have a minute I am on the creek. Roanoke River Partners has built 12 camping platforms with names like Barred Owl Roost, Beaver Lodge and Cypress Cathedral along the Roanoke and Cashie Rivers. It is a great way to really know what happens in this part of the Great Dismal Swamp. Carolyn Roberson ran Roberson’s Marina on Gardner’s Creek, and to me she was the Keeper of the Creek. Carolyn knew and loved these waters, she and her husband Ed ran this same marina before he died. She lost a leg, but that did not hamper her spirit. If you want to make a reservations, call Roanoke River Partners. When I was looking for a catfish recipe, I certainly knew who to ask – it was Carolyn. On July 18, 2007, the Washington Post ran a story about these wonderful camping platforms: “Swamp Things in North Carolina, Paddle down a Creek”, by Diane Daniel. And if you don’t really want to sleep in the swamp on a platform, Ms. Daniel suggests staying at Big Mill Bed and Breakfast. Carolyn Roberson of Roberson’s Marina on Gardner’s Creek knew all about this creek. Luckily for us, she cared about this fragile ecosystem. When I asked about her catfish stew she told me that you can make it with most any fish you have, even shrimp or crab meat. You eat what you catch. And folks are still catching fish with cane poles on Gardner’s Creek. Come join us at Big mill B&B; we have the poles. Put water, 2 cups of the chopped green onions, sliced onions, red peppers, bacon drippings, fatback and drippings in a large stew pot. Cook uncovered over medium heat until onions dissolve, about 30 minutes. Add baking potatoes to the pot. Make a layer of catfish on top of potatoes. Add dumplings (recipe below) on top of the catfish. Do not stir. Cook until potatoes are tender and catfish is flaky, about 20-30 minutes. You can shake the pot, but do not stir. When pot contents are done, remove from heat. Combine eggs, reserved bacon, reserved cup of green onion tops, salt and pepper. Pour evenly over contents of pot and cover pot. Let stand 30 minutes. When serving, gently spoon out in sections because the stew will be in layers. • Enough warm water to make a stiff paste. Stir together corn meal, flour, sugar and salt. Slowly add enough warm water until you can form small balls about the size of a walnut. Dough will be a very stiff paste. Flatten dumplings to be the size of a fifty-cent piece. Place dumplings on top of potatoes and catfish. Cover and simmer but do NOT stir. Keep enough water in pot to avoid sticking and shake pot occasionally. Carolyn said that cooking is part art. The amount of water to add to the pot and the dumplings is a matter of judgment. Make sure the water does not boil out because the stew will burn. Also, gently shake the pot from time to time to make sure it is not sticking. But do not stir! Note: fatback is the same as salt pork, sometimes referred to as “streak of lean, streak of fat“. This is readily available in any grocery store south of that famed Mason-Dixon Line. (South of Virginia, and more realistically, south of Richmond) If unavailable, very thick sliced bacon with skin may be substituted.